Remains of Burke residents lie in the historic cemetery that is now marred with spray paint. Burke — Prominent Burke founders John and Mary Marshall helped form the town of Burke, witnessed Civil War activity around the area and made their mark on the community. But vandals found their cemetery in the central wooded section of Burke, and left a mark on the memorial with orange spray paint. John Marshall owned a general store in Burke and was the postmaster from 1852 to 1854, later managing the affairs of Mrs. Silas Burke, the sign on the cemetery states. Upon discovery of this vandalism, an individual reported it in person to the Fairfax County Police Department, but when they tried to get her name, she was nowhere to be found. Then on Aug. 9 an officer visited the site and ran into a person who is taking care of the cemetery. 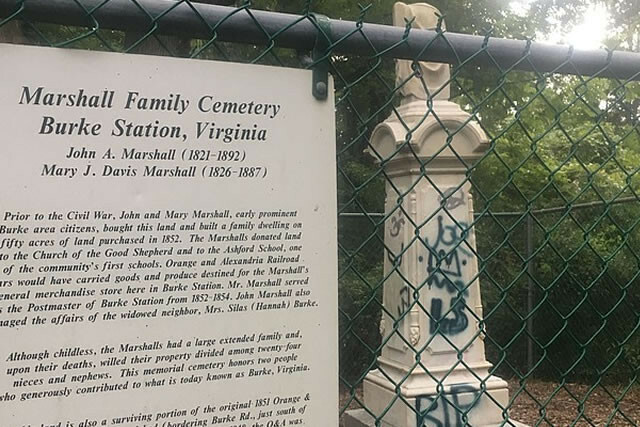 There was a conversation, according to officer Michael Cole, a Fairfax County Police Department compliance manager, and they discussed cleaning the monument or coating it with a substance that would make graffiti easier to remove but the conversation did not go further than that. The official word is “it’s under investigation,” Cole said. 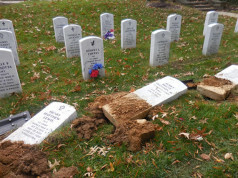 Mary Lipsey, the head of the Fairfax County Cemetery Preservation Association, brought this vandalism to the attention of Pat Herrity, the Springfield District Supervisor. 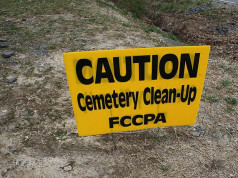 “I was saddened to hear about the vandalism of the historic cemetery and Fairfax County is doing what it can to catch the vandal,” Herrity said. An inquiry was made to the Burke Historical Society but they have not responded, although their website does mention the cemetery and the vandalism as well. “John and Mary Marshall, prominent 19th century citizens of Burke, are buried in this cemetery. Mr. Marshall owned a general merchandise store, and served as the postmaster of Burke’s Station. 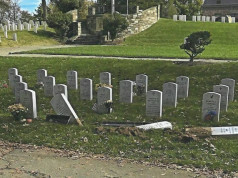 Unfortunately, the cemetery has been vandalized,” reads the website entry.